Limestone cliffs near Solutré, at the foot of which is the celebrated archaeological site of Crôt du Charnier. 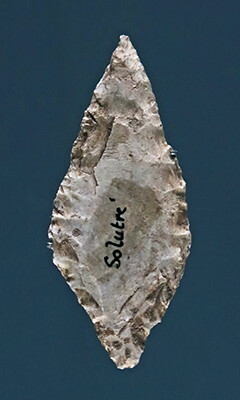 The Solutrean takes its name from the Crôt du Charnier site in Solutré-Pouilly, in Saône-et-Loire. During all the upper Paleolithic, Solutré was a site which specialised in the hunting of horses, where prehistoric men returned periodically. It does not include living areas occupied for long periods, but there are specialised areas of activity, especially the processing of game after the hunt. 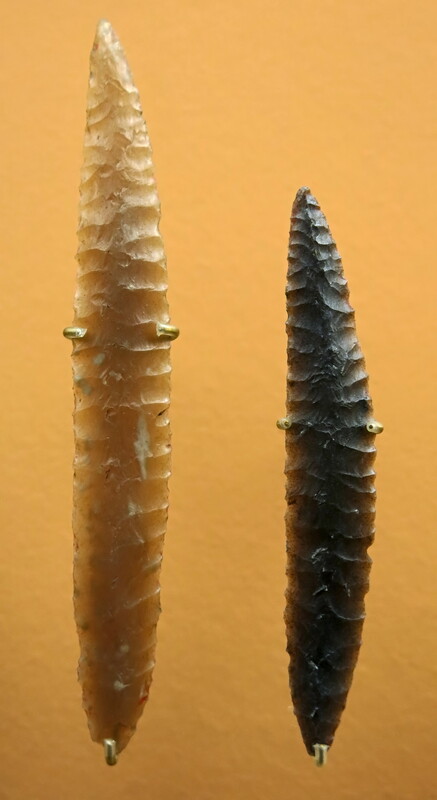 Some tools - pointes à face plane, laurel leaves, shouldered points - were made by a sophisticated retouch that was obtained by a new technique called pressure flaking, on flint which had been heat treated to make it much more workable. 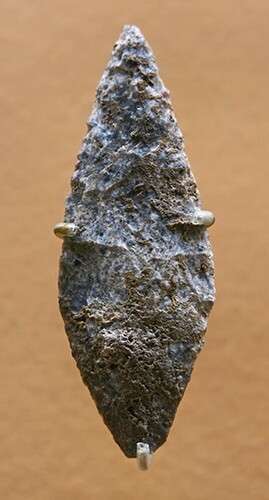 To make these lanceolate (leaf-shaped) points, the Solutrean people developed an exceptionally deft technique of pressure flaking – pressing with a soft tool such as an antler tine or bone point – instead of striking directly with a soft or hard hammer. 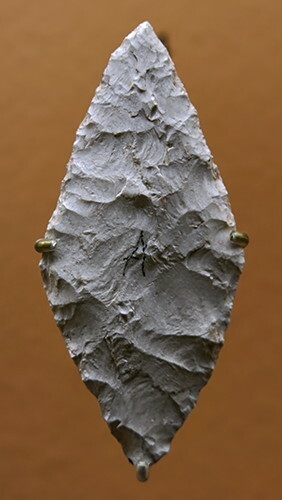 There are other examples of this technique in prehistoric implements but the Solutrean people raised this technique to an artform where their arrowheads and spearpoints were as efficient as possible and like many optimum designs - an aircraft's wing, say – they also exhibit a form of beauty. 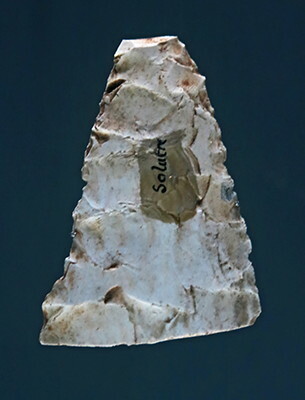 The Solutrean technology is largely isolated in the prehistoric record. 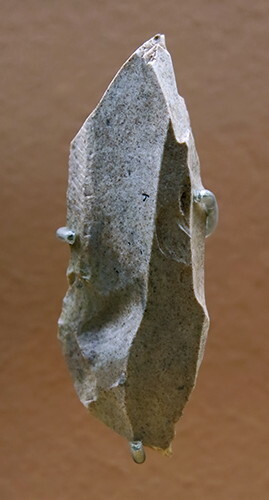 It was preceded by an industry based on Acheulian bifaces and scraper tools and it was succeeded by the widespread adoption of microlith technology in the Upper Palaeolithic and Mesolithic periods. It was the dominant technology for the relatively short space of time from 21 000 years ago to circa 15 000 years ago. 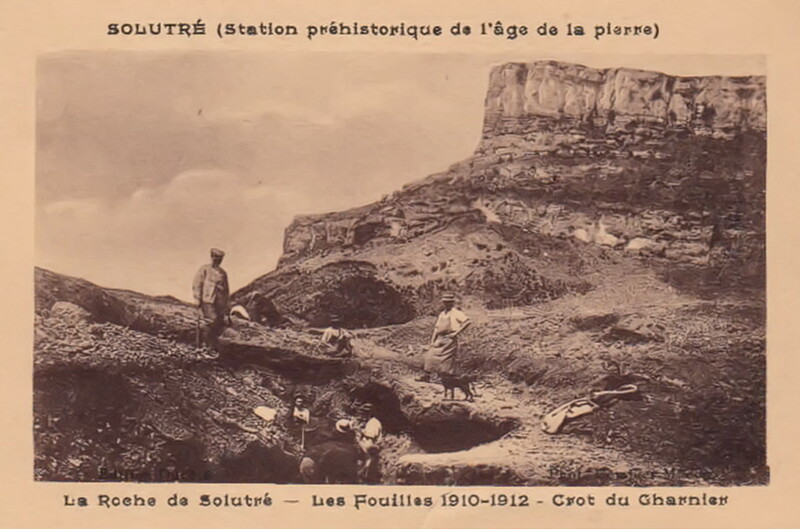 The earliest excavations at Solutré began in 1866 under the direction of Adrien Arcelin and Henri Testot-Ferry, with efforts focused on the so-called 'horse magma', a layer of accreted horse bones, and several foyers du renne, hearths ostensibly of the l’age du renne, or the Solutrean. 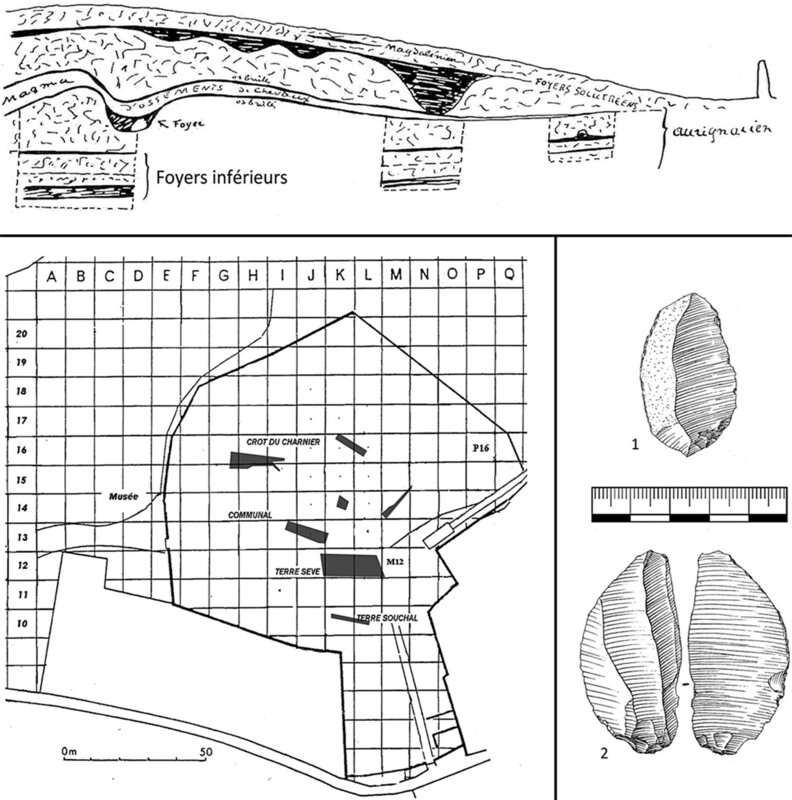 Between 1873 and 1895, Arcelin, with the aid of Abbé Ducrost, conducted further excavations at the site, which identified three successive culturally distinct layers of occupation, Solutrean, Gravettian, and an unattributed basal stratum, which was subsequently defined in 1907 by Abbé Breuil as Aurignacian. Continued work in the 20th century by the University of Lyon and Jean Combier on behalf of the CNRS have combined to produce a fairly fine-grained understanding of the complex nature of over 20 000 years of occupation and activity at the site of Solutré. The Solutrean in Western Europe. (right) Grattoir made on a retouched blade. Tips of laurel leafed blades. 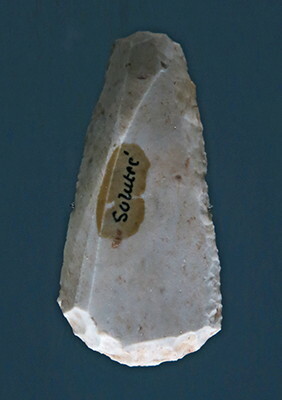 Provenance: Solutré, Crôt du Charnier at Solutré-Pouilly, in Saône-et-Loire. Tools from Solutré, Solutrean, 18 000 BP. 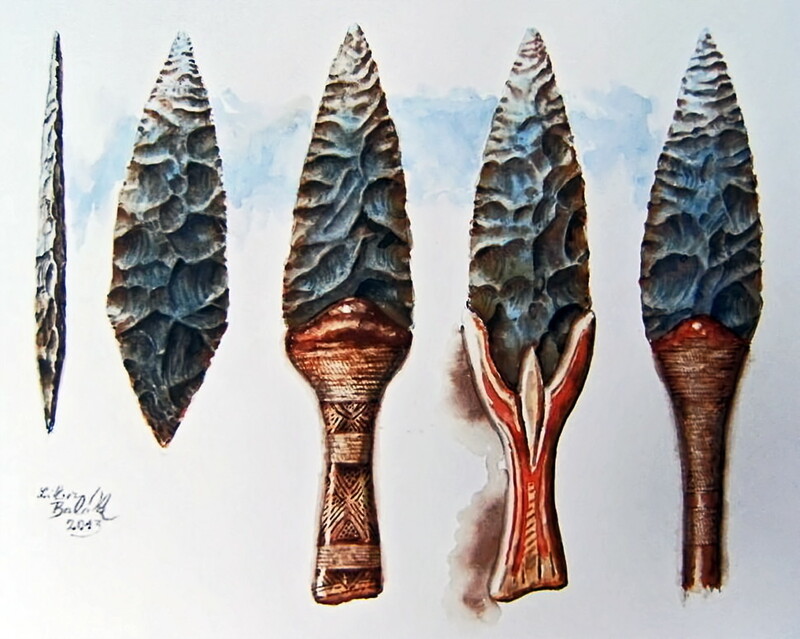 Libor Balák is a highly talented artist who makes a specialty of depicting life in Palaeolithic times. 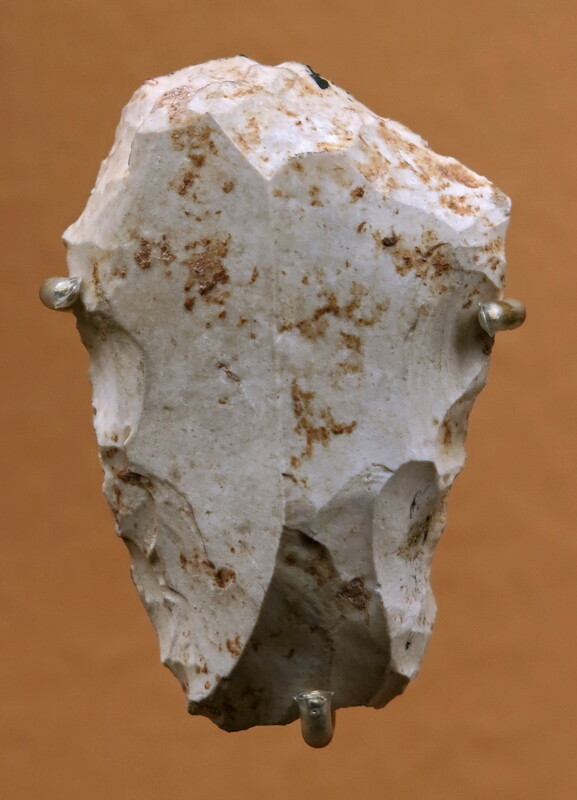 His vast knowledge and ability to communicate his understanding in a graphical manner makes his work very useful indeed to students of the Palaeolithic. The second picture from the right shows a tool hilt found in the Pekárna cave in Moravia . Because many of the laurel-leaf points were very fragile, large and thin, they may have been used as knives rather than spear points, with the knife usually kept ensheathed in a scabbard for protection and ease of use. The prestige and appearance of the tool was probably more important than the fact that the blade was quite fragile. 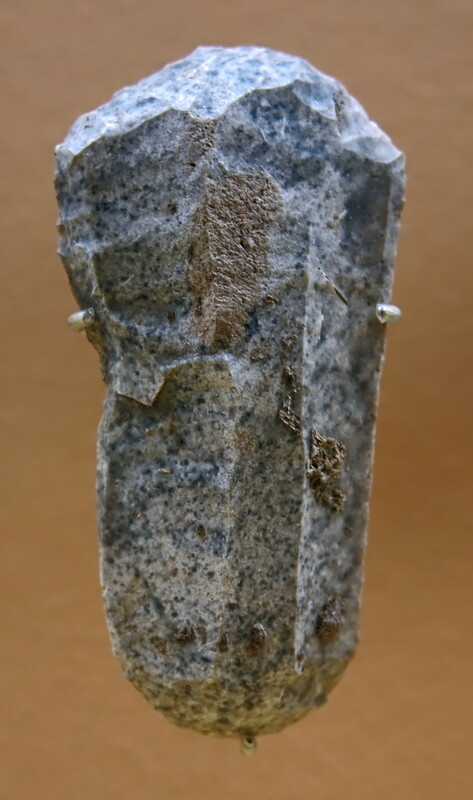 It is likely that the very large and thin laurel-leaf blades were more status symbols than useful tools. 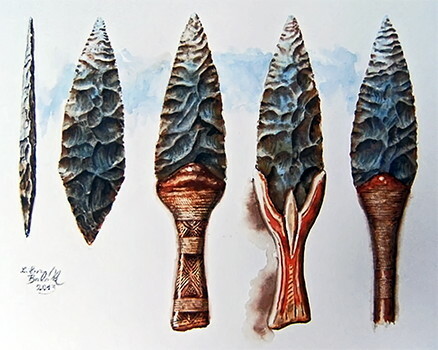 Shown here are two other possibilities for the design of handles for the Solutrean laurel leaf points. 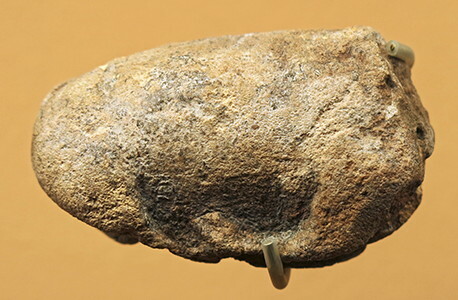 Lower (Early) Magdalenian Prototypes of bone harpoons. 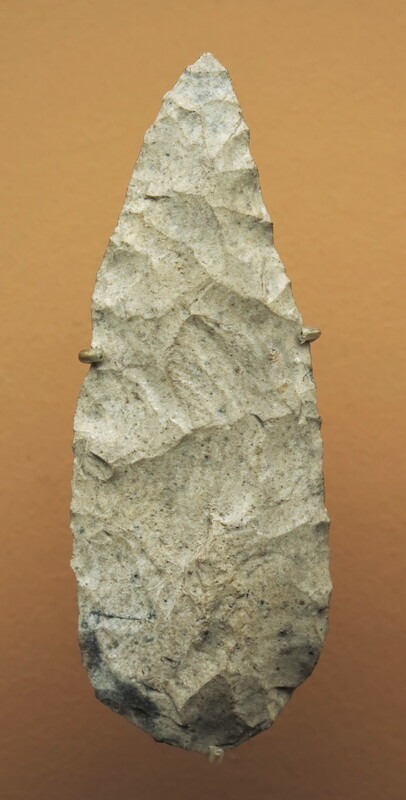 Absence of any trace of the laurel-leaf spear heads of Solutrean times. Upper (Late) Solutrean Typical shouldered points (pointes à cran)- elongate flakes worked on one or both sides and notched. 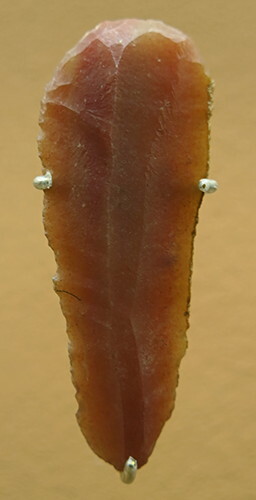 Middle (High) Solutrean Large 'laurel-leaf' spear heads worked on both sides. Transition from Aurignacian Pedunculate spear heads (pointes à soie) of primitive Font Robert type. 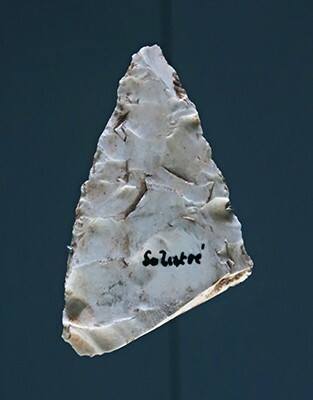 The type station of the Solutrean culture is the great open-air camp of Solutré, near the Saône, sheltered on the north by a steep ridge and with a fine, sunny exposure toward the south. The traces of this great camp, which is the largest thus far discovered in western Europe, cover an area 300 feet square and are situated within a short distance of a good spring of water. 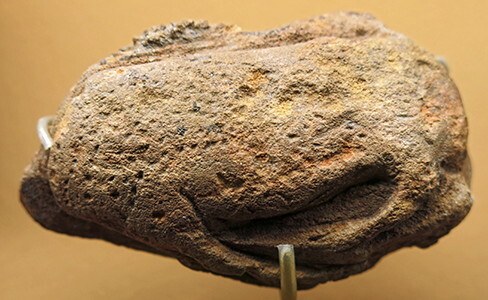 As explored, in 1866, by Arcelin, Ferry, and Ducrost, this station had already been occupied in Aurignacian times; and two sections, taken at two different points, showed the deposits of the old camp to be from 22 to 26 feet in thickness, representing superposed Aurignacian and Solutrean fire-hearths with thick layers of intermediate debris. 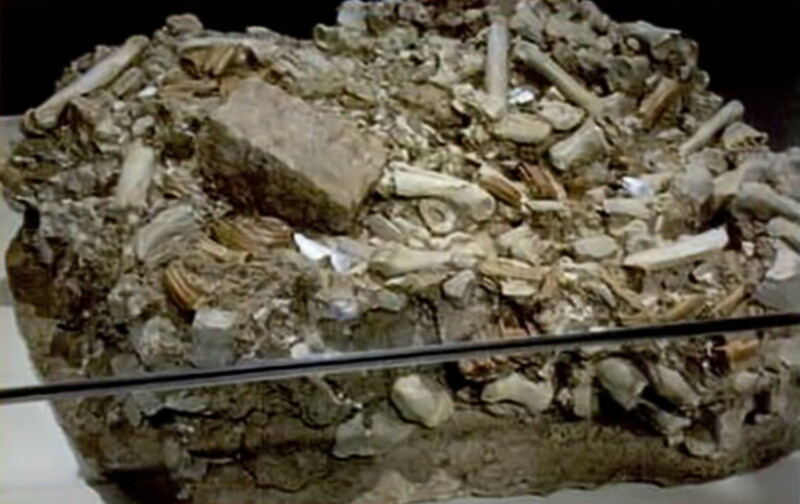 In the Aurignacian level is found the vast accumulation of the bones of horses which first brought the site to the attention of archaeologists. 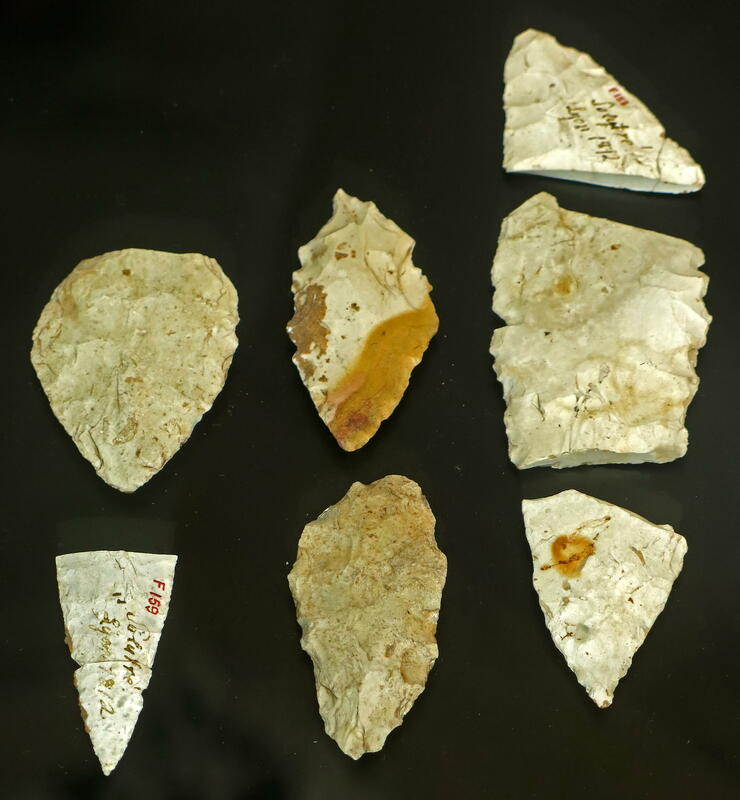 In the middle Solutrean levels great fireplaces are found with flint utensils and the remains of abundant feasts among the charred debris. The fauna includes the wolf, the fox, the hyena, both the cave and the brown bear, the badger, the rabbit, the stag, wild cattle, and two characteristic northern forms- the woolly mammoth and the reindeer; the remains of the last are the most abundant in the ancient hearths. 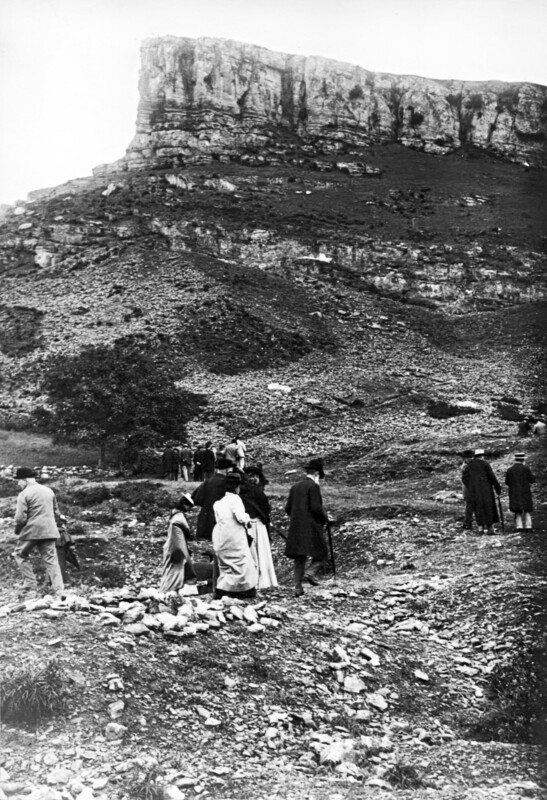 Excavations in the 19th Century. 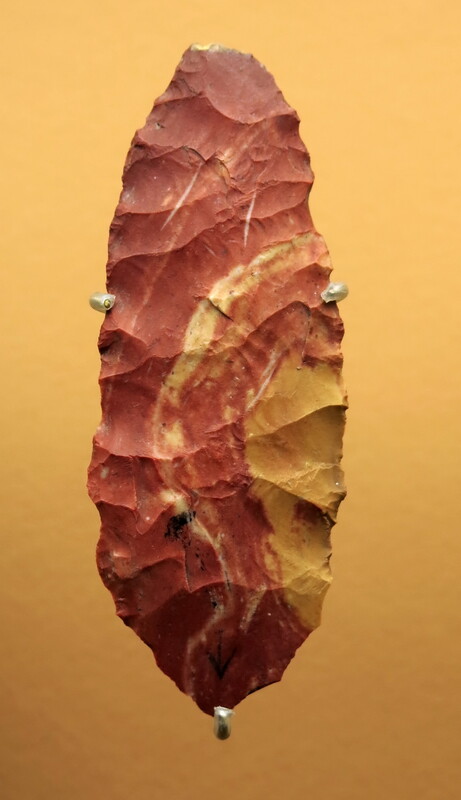 Excavations at the foot of the rock started in 1866, in a place known as the 'Crôt du Charnier', on a protrusion of horse bones, which no one imagined at the time would date to prehistory, as archeology was just emerging as a scientific field at the time. 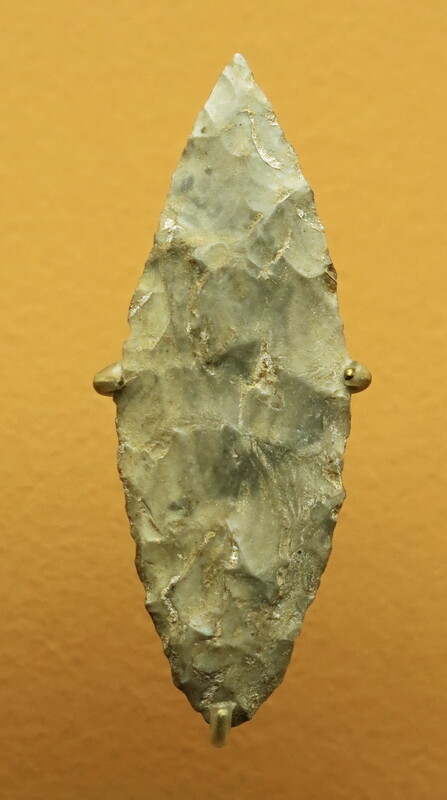 The zone of Upper Paleolithic sites was soon discovered by Henry Testot-Ferry. Numerous flint tools were found, including spear-points, knives and scrapers, and also a large number of bones, mainly from reindeer, but also from horses, mammoths, wolves, and cave lions. Testot-Ferry and Adrien Arcelin decided to see if they could determine scientifically how large the deposit was that they had brought to light, and to examine with great care the remains that they had recovered. The challenge was to understand the arrangement of stratigraphic areas of the site, which would be the basis for establishing a chronology. 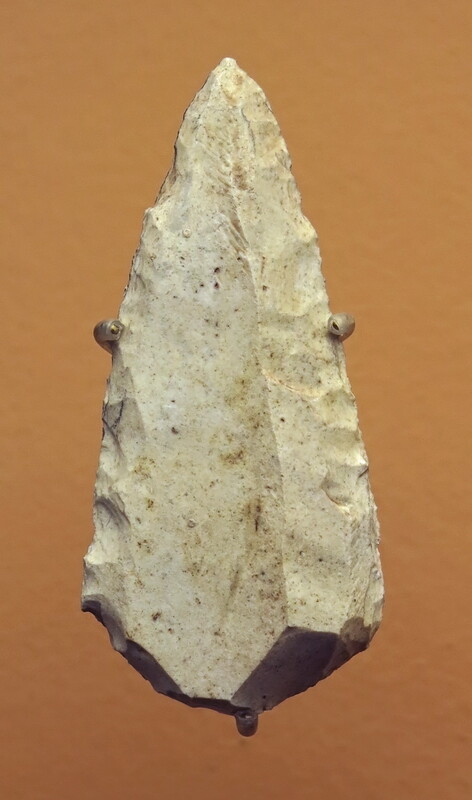 In 1868, the preferred scientific hypothesis viewed the site as a hunting station. The two discoverers called on specialists and presented their work at conferences. Solutré was revealed as one of the greatest prehistoric sites in France. 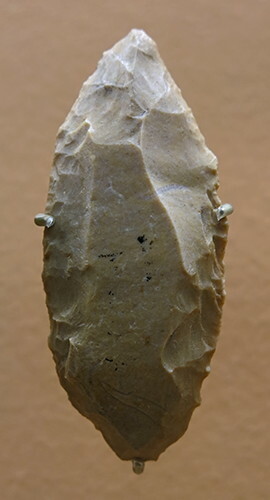 In 1872, Gabriel de Mortillet, one of the most important prehistorians of his time, decided to name prehistoric periods after sites where they were particularly well presented. Thus the term 'Solutrean' was born. Numerous excavations were conducted after Gabriel de Mortillet defined the period as Solutrean in 1872. 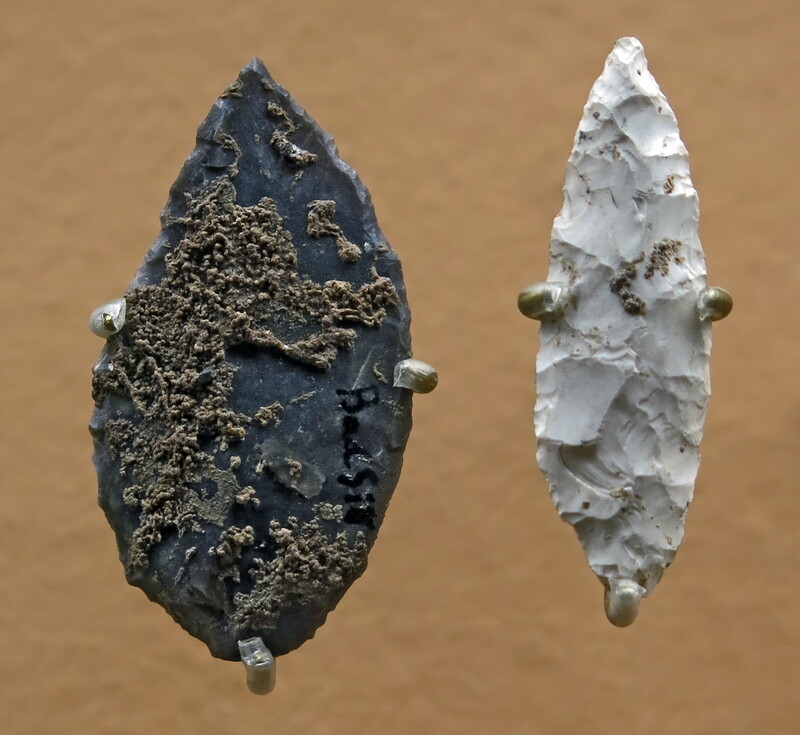 The excavation site remains protected, and partially unexplored, to this day. 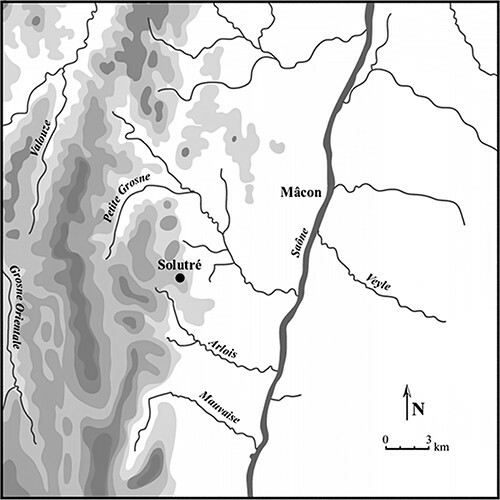 The height of the sites in relation to the flood plain was the most important factor for human habitation. Providing food and shelter for nomadic groups, the foot of the rock, strewn with debris, also afforded hunters the opportunity to develop traps. 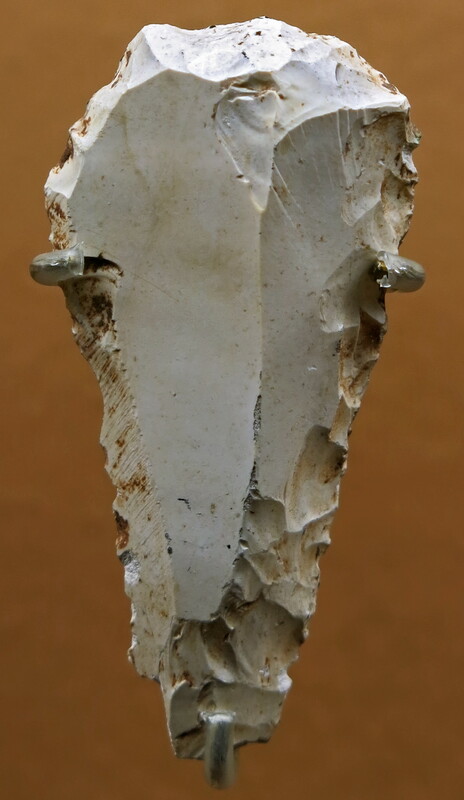 The bone-laden 'magma' can be explained by the fact that the site was used by four great palaeolithic civilisations over the 25 000 years from 37 000 to 12 000 BP, an extremely long time period. 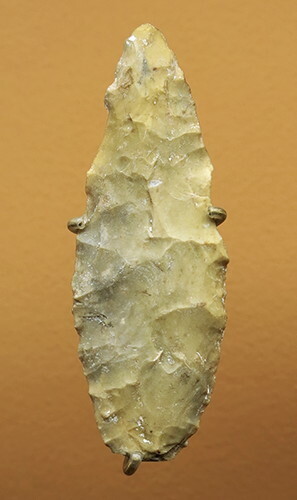 The use of this site was therefore devoted to hunting activity, butchering and drying meat, while the neighbouring Rock of Vergisson was a site for habitation. 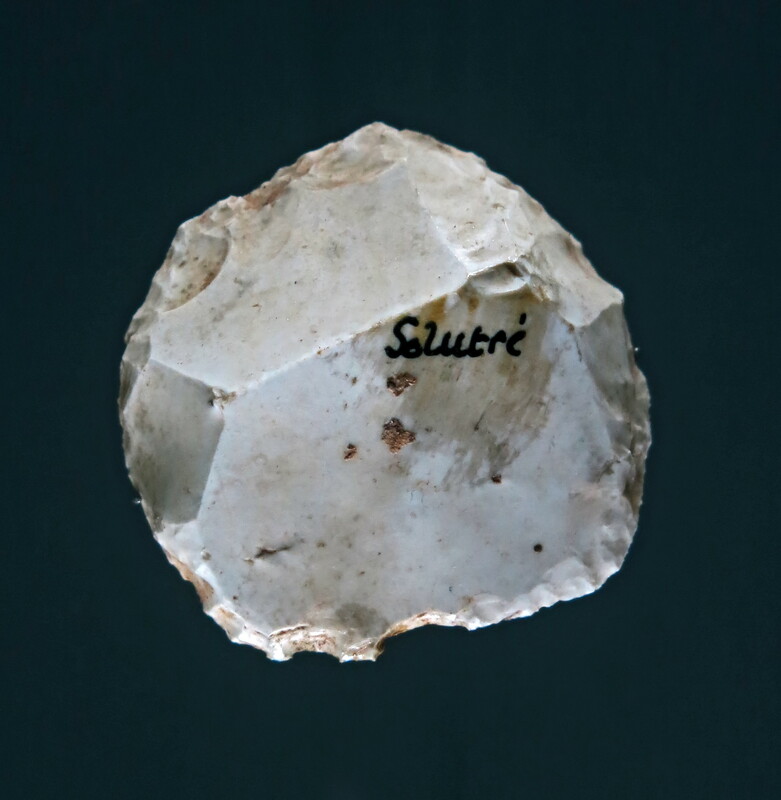 The material found at Solutré was therefore linked with hunting; many tools were found including flints in the shape of laurel leaves which are characteristic of Solutrean culture. 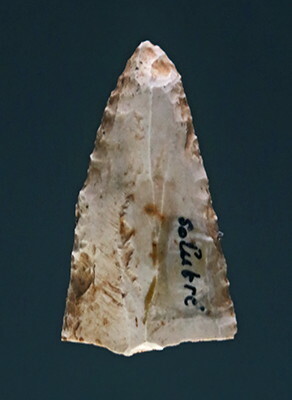 The type station of the Solutrean culture is the great open-air camp of Solutré, near the Saône, sheltered on the north by a steep ridge and with a fine, sunny exposure toward the south. The traces of this great camp cover an area 100 metres square and are situated within a short distance of a good spring of water. As explored, in 1866, by Arcelin, Ferry, and Ducrost, this station had already been occupied in Aurignacian times; and two sections, taken at two different points, showed the deposits of the old camp to be from 7 to 8 metres in thickness, representing superposed Aurignacian and Solutrean hearths with thick layers of intermediate debris. In the Aurignacian level is found the vast accumulation of the bones of horses commonly known as 'the magma'. 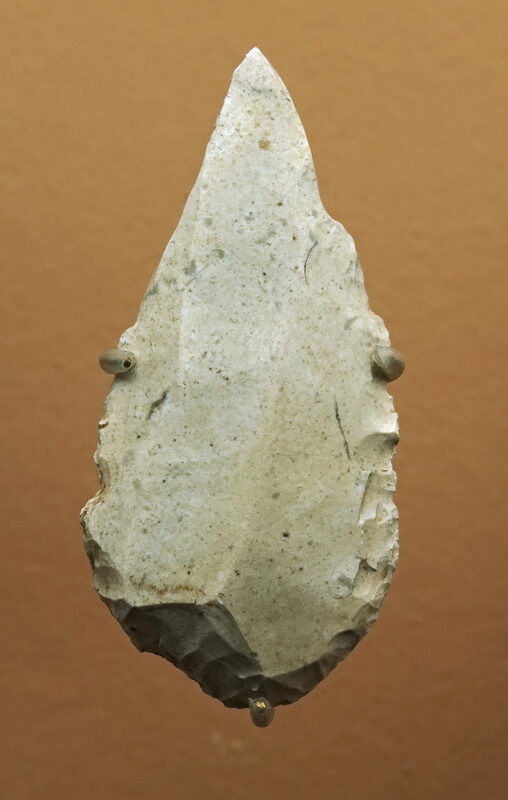 In the middle Solutrean levels great fireplaces are found with flint utensils and the remains of abundant feasts among the charred debris. The fauna includes the wolf, the fox, the hyena, both the cave and the brown bear, the badger, the rabbit, the stag, wild cattle, and two characteristic northern forms- the woolly mammoth and the reindeer. 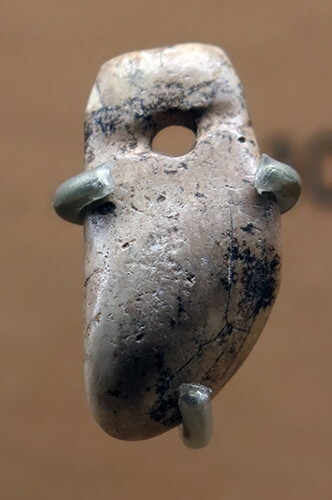 Reindeer remains are the most abundant in the ancient hearths. The lower layers at Solutré. 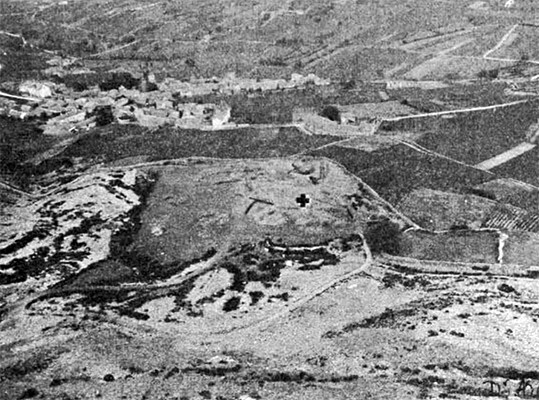 (left) Solutré site plan, the grey zones represent areas where the lower layers occur, Combier 1955. (right) Atypical backed knives from the lower layers, Combier 1955. 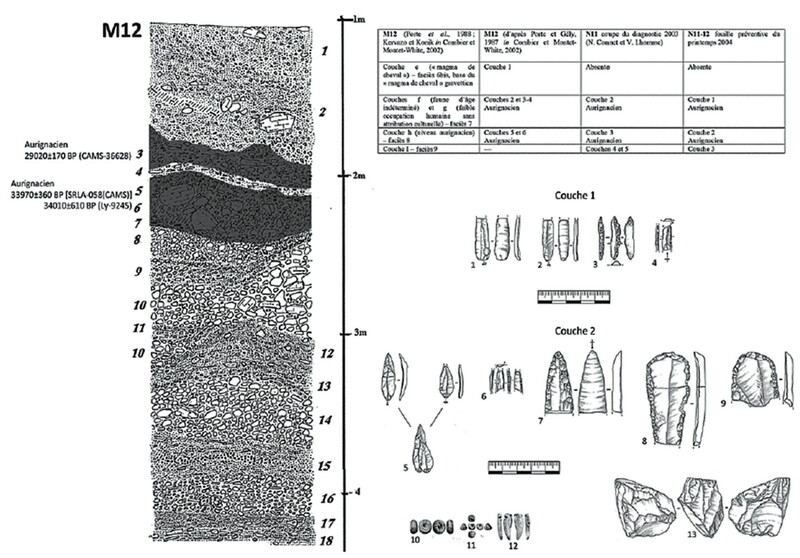 (left part of image) Stratigraphical sequence in the sector M 12, Combier et Montet-White (2002). (right upper part of image) Stratigraphical correlation between the sectors M 12 and N 11-12, Connet et al. (2005). Resting reindeers sculpted on pebbles. (left) Baguette, a cylinder of uncertain use and material in this case. 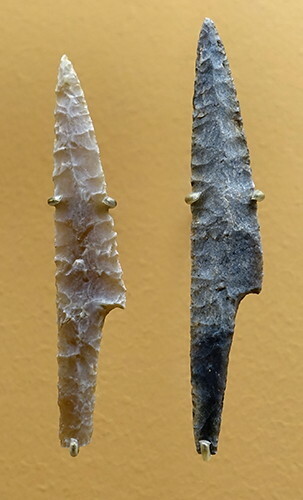 (left and above) Laurel leaf points. Grattoir (left) and grattoir-burin (right). 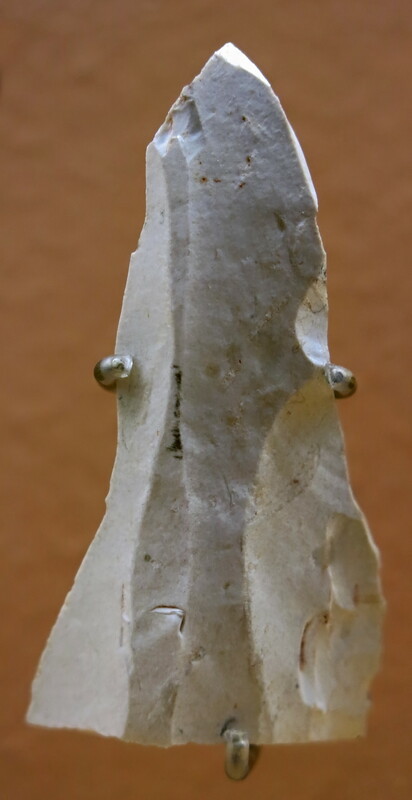 (right) Pointe de sagaie à base raccourcie, or spear point with a shortened base. 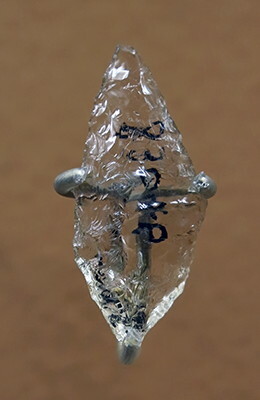 The rock crystal leaf point on the right is a demonstration of the skill of the knapper. 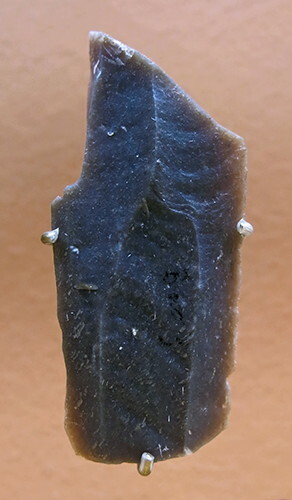 Quartz is not nearly as easy to work as flint, as is obvious here, where the shape is not as symmetrical as in comparable flint leaf points. Heat treatment is not effective, and the knapper needs to use wood instead of stone as a hammer'stone'. 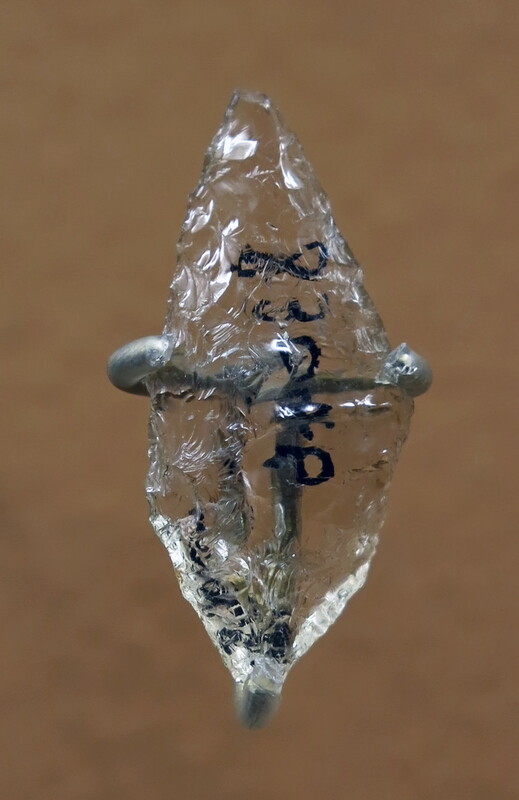 The results can be beautiful, but rock crystal is more suitable for status objects and a challenge for the knapper than for useable tools. Type A: Nearly or fully symmetrical, pointed on both ends, or on only one end, which can be occasionally rounded. 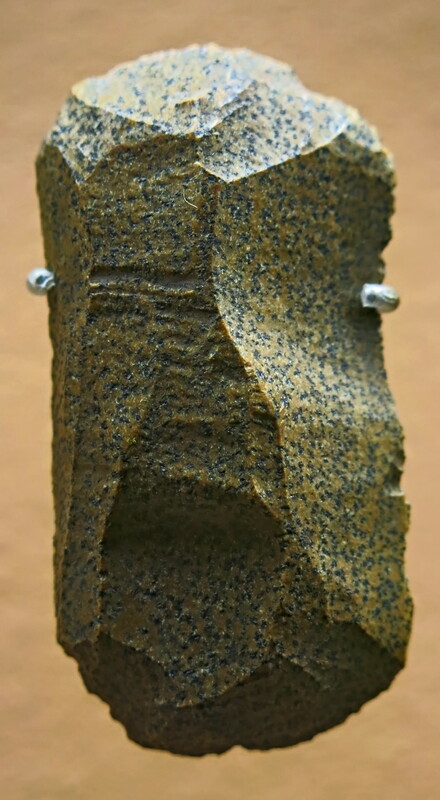 Upper face covered with flat retouches. Lower face plain or retouched over a limited part of its surface. 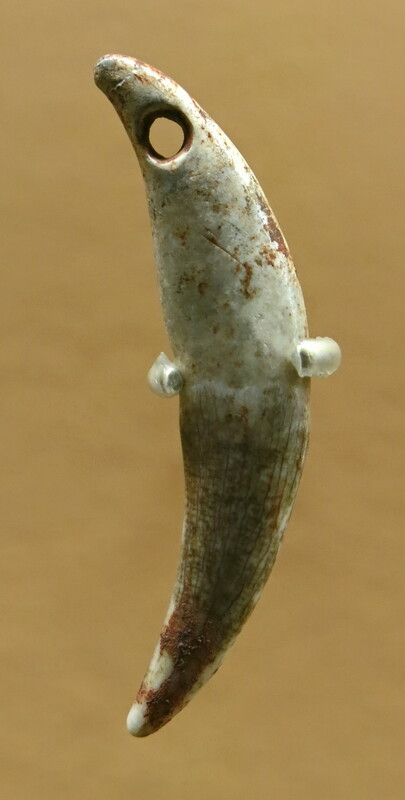 Type B: The most typical points at Laugerie: teardrop shaped or déjeté ('skewed') usually to the right. Much of the upper face retouched along the left side of the median ridge. Occasionally the upper face is entirely retouched. Bulb at the base may have been removed by retouches. 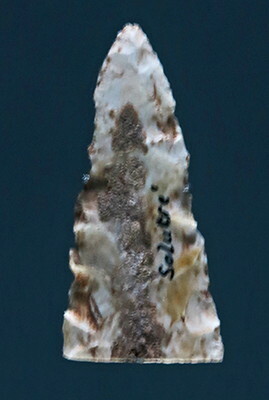 Type C: 'Chatelperron- like', slightly curved and made on a long blade. 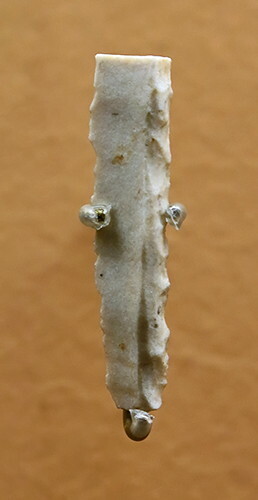 The retouches are concentrated on one side of the median spine of the upper face. Bulb at the base may have been removed by retouches. Type D: Broad and heavy, made on a flake with flat retouching covering the upper face and parts of the lower face. 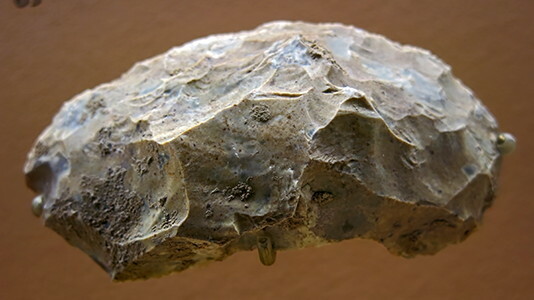 'Mousterian-like' and found throughout the Solutrean and not only in the earlier phases. Type-site: Badegoule. Type E: essentially only pointed blades. 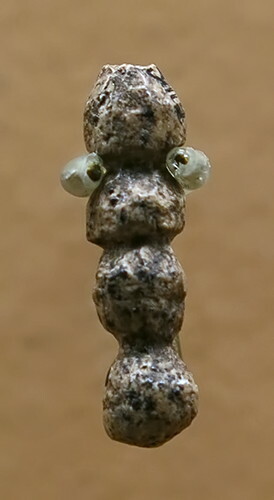 Single or double tipped. Flat retouching concentrated around the tip. Pointes à cran, shouldered points. 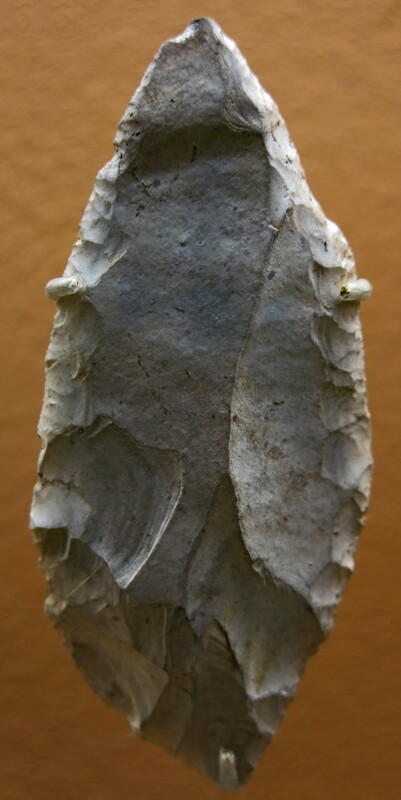 Used to make holes in items such as leather. Spear point with a simple base. Tiny Ammonite shell fossil, with a convenient pre-existing hole, used as a pendant. 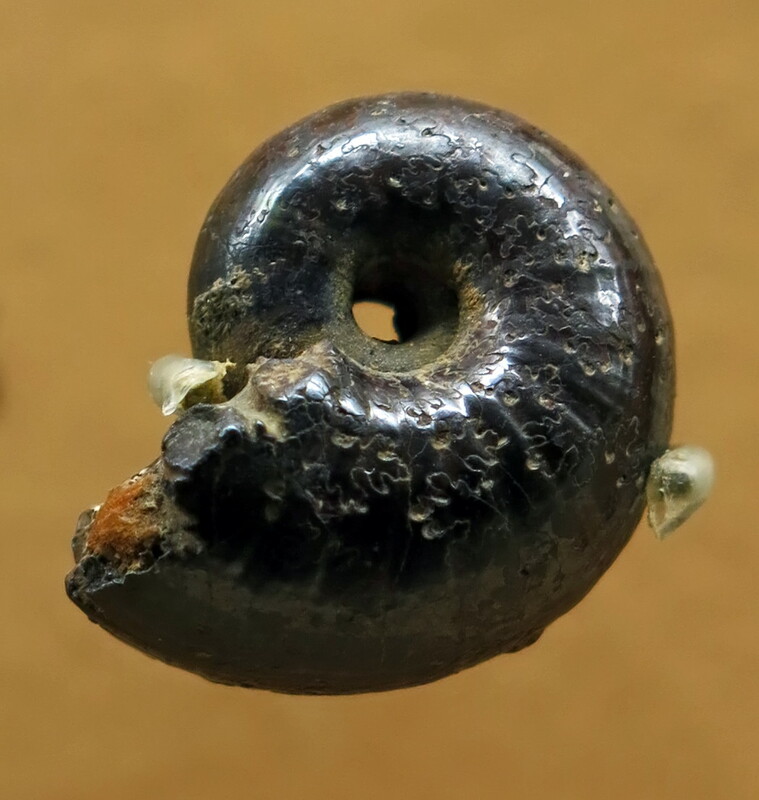 Some ammonite fossils, like this one, bear intricate patterned details on their outer surface called Sutures. These are located beneath the external shell wall, but are often visible if the fossil has been subject to weathering or artificial polishing. These patterns mark where the walls of the chambers, the septa, meet the outer wall of the ammonite shell. The bulk of each septum is relatively flat, but becomes folded where it meets the outer shell. This method of construction is thought to have provided strength to the shell when diving to deeper depths. 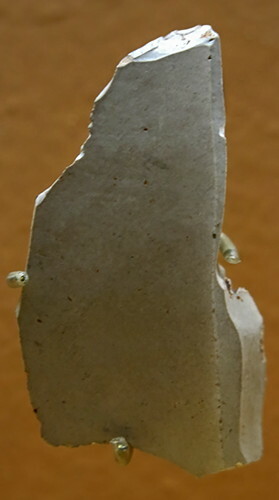 Suture patterns are very useful for distinguishing different species of ammonite. Laurel leaf blade of prodigious length/width ratio. (left) Poinçon, awl, with engravings. 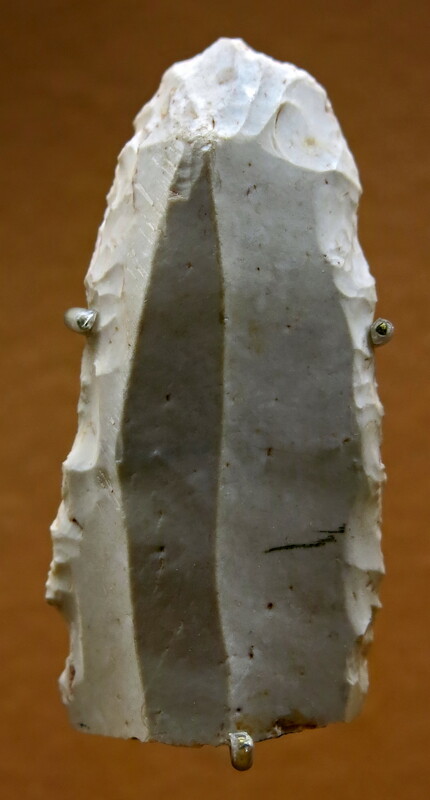 (centre) Spear point with a simple base. 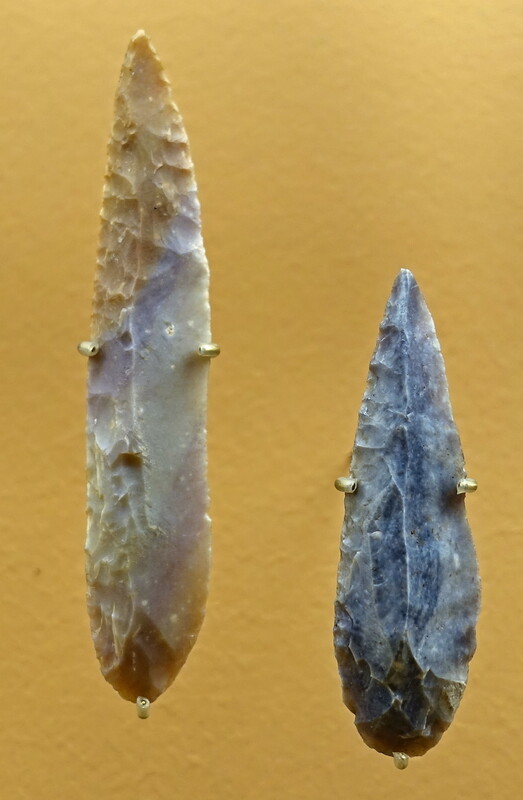 (right) Spear point (? ), engraved. (left) Hairpin, (right) Double ended point. (left and centre) Pendants used as jewellery, originals. ( My favourite of all of these shouldered points is the one on the far left. The technique and form is exemplary, the zenith of the art. The flint used is unique and fascinating, the same as one of the grattoirs above. Readers should realise that these tiny tools were made with a full arsenal of skill and technique never before attained, of heat treatment of the flint and pressure flaking on an extremely small artefact. 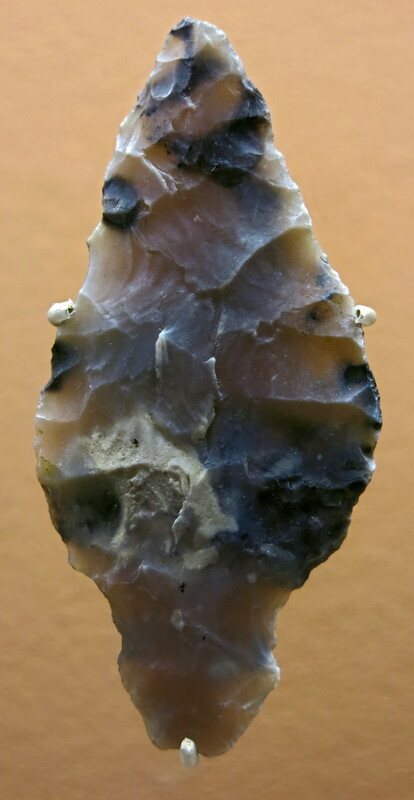 This is a tribute to the integrity and total control of the knapping process by the Solutrean master craftsmen, a level of ability which would never afterwards be approached for tens of thousands of years, until modern times in the 21st Century by dedicated knappers. ( note the point on the right of this group of three laurel leaf points. At first sight it looks ugly and ungainly. However it is one of the few laurel leaf points which may well have been designed for actual use in hunting, most look as though they are too thin and large to ever have been used in anger, they are more like status symbols. This one is shorter than the shouldered points above, though considerably wider. 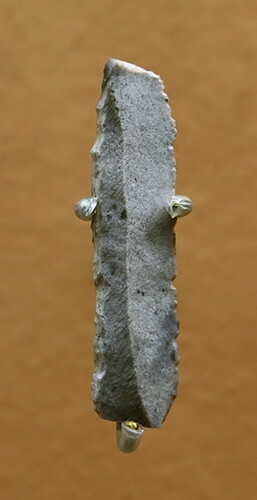 Double racloir, or sideways scraper, with two useable edges. (left): Solutrean shouldered point from la grotte du Placard. Dimensions: 150 mm long, 80 mm wide, 5 mm thick. 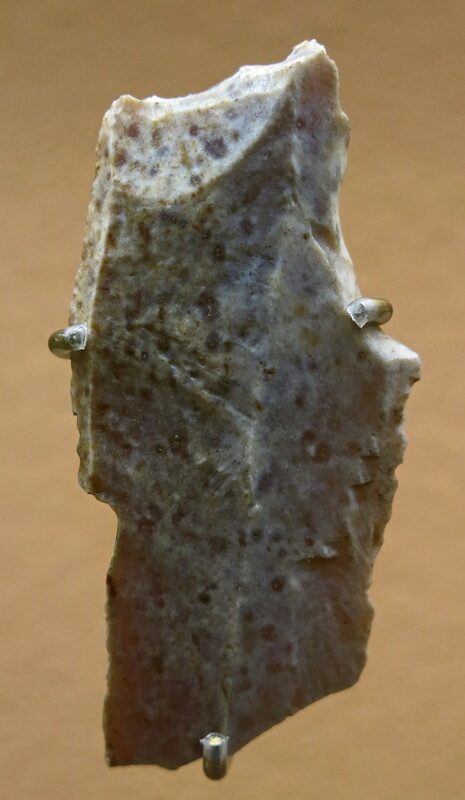 (centre left):Solutrean shouldered point from la grotte du Placard. Dimensions: 83 mm long, 16 mm wide, 5 mm thick. (centre right): Solutrean shouldered point from la grotte du Placard. Dimensions: 83 mm long, 15 mm wide, 3 mm thick. (right): Solutrean shouldered point of unknown provenance. Laurel leaf point from la Grotte du Placard. Dimensions: length 191 mm, width 41 mm, thickness 6 mm. 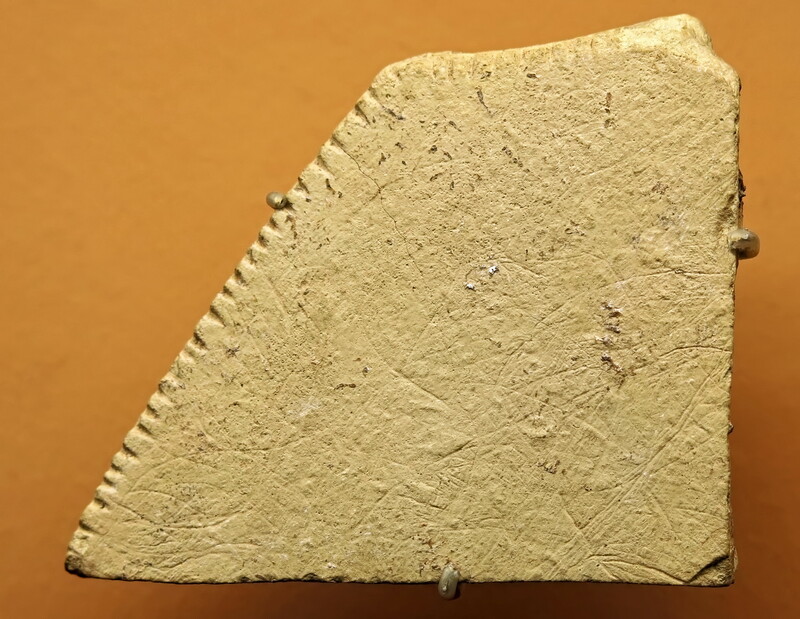 Feuilles de saule, Willow leaf points. 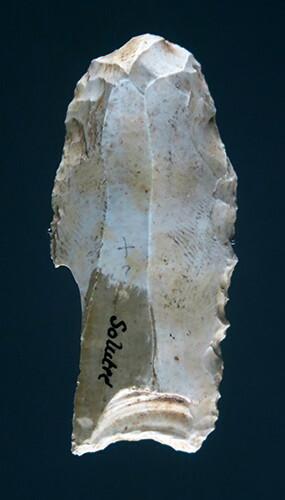 These superbly made blades, slim, with rounded ends and retouching on one side only, made their appearance in the late Solutrean. Left: Feuille de saule, Willow leaf point, from la grotte du Placard. 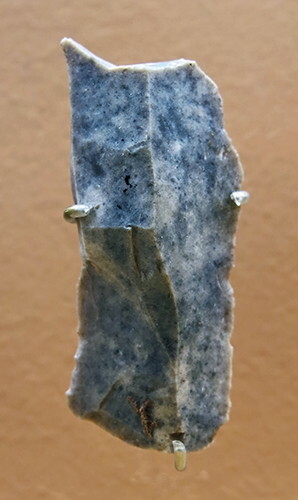 Dimensions: 132 mm long, 18 mm wide, 5 mm thick. Right: Feuille de saule, Willow leaf point, from la grotte du Placard. Dimensions: 99 mm long, 16 mm wide, 4 mm thick. 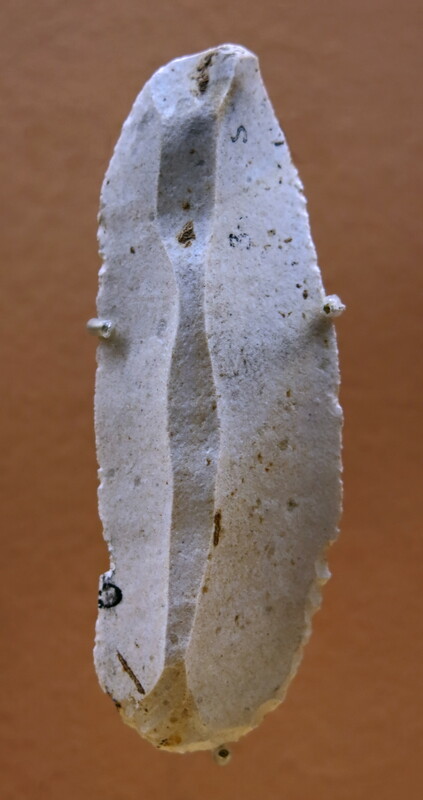 Solutrean bone Poinçon or awl for making holes in leather from Laugerie Basse. Dimensions: length 87 mm, width 13 mm, thickness 4 mm. Breuil H., 1909: L'Aurignacien présolutréen, épilogue d’une controvers, Revue préhistorique, 4, 8-9, p. 5-46. Combier J., 1955: Les fouilles de 1907 à 1925. 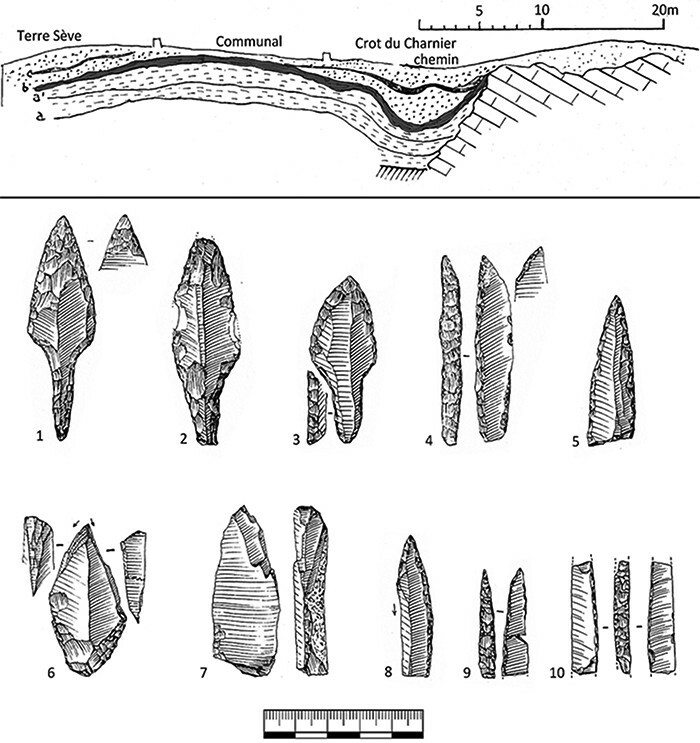 Mise au point stratigraphique et typologique, in M. Thoral, R. Riquet et J. Combier (dir. ), Solutré, Mâcon, éd. Faculté des Sciences de Lyon, Travaux du laboratoire de géologie de la faculté des Sciences de Lyon, nouvelle série 2, p. 93-220. 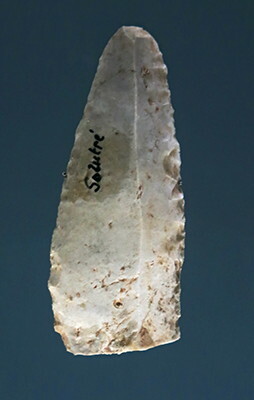 Combier J., Montet-White A., 2002: Solutré 1968-1998, Paris, éd., Société préhistorique française, (Mémoire 30), pp. 281. 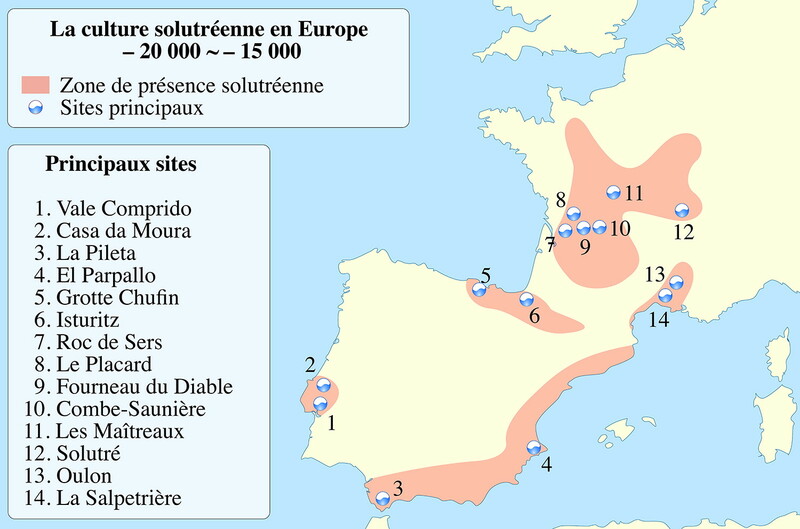 Connet N. et al., 2005: L’occupation aurignacienne de Solutré (Crôt-du-Charnier et Terre-Sève ; 71) : les données de la fouille 2004, Rapport final d’opération, Inrap, Dijon, DRAC de Bourgogne, pp. 122. Yelkrokoyade, 2009: Vue du village de Solutré-Pouilly - Saône et Loire (71), France, Wikimedia Commons. This file is licensed under the Creative Commons Attribution-Share Alike 1.0, 2.0, 2.5, 3.0 licenses.